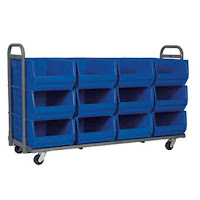 Use Akro-Bins or Stack N Store bins to fit all your heavy duty industrial or Home needs. My favorite is the Nest & Stack Totes (NST’s). These totes are heavy duty, durable, which give your the flexibility to nest for shipping and storage, and stackable with lids. The containers are made of FDA-sanctioned materials (some are made of high impact polypropylene and some HDPE) that make them extremely long-lasting, rust-free, corrosion-proof and safe for meat and poultry applications. They won’t bend out of shape even when they are fully loaded. NST’s are highly versatile. Use them for storage, transfer or shipping applications. The containers have smooth surfaces, making them easy to clean. They also resist most solvents and chemicals and the rib structure under the lip helps prevent jamming when nested. The textured bottoms provide no-slip grip service when put on conveyor belts. Forget the “budget-priced” totes. They’ll break easily and in the long run will cost you more on heavy-duty jobs. NST’s are available in 9 sizes: 0.50 Cu ft, 0.76 Cu Ft, 0.80 Cu Ft, 1.20 Cu Ft, 1.70 Cu Ft, 2.0 Cu Ft, 2.60 Cu Ft, and 3.70 Cu Ft, each is offered in 3 color choices: grey, red and blue. If you want to protect contents from dust and damage, purchase NST’s lids too. Also, get the label plastic holders for easy content identification. 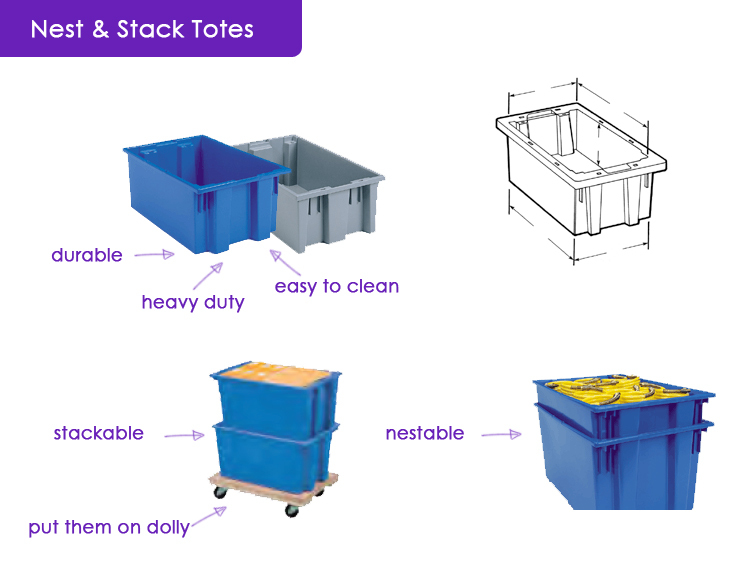 Industrial storage is made easy with Nest & Stack Totes! Other accessories to use with NST's: dollies and carts.